François Joseph Paul, comte de Grasse (13 September 1722 – 11 January 1788) was a career French officer who achieved the rank of admiral. He is best known for his command of the French fleet at the Battle of the Chesapeake in 1781 in the last year of the American Revolutionary War. It led directly to the British surrender at Yorktown and helped gain the rebels' victory. After this action, de Grasse returned with his fleet to the Caribbean. In 1782 British Admiral Rodney decisively defeated and captured Grasse at the Battle of the Saintes. Grasse was widely criticised for his loss in that battle. On his return to France in 1784, he demanded a court martial; it acquitted him of fault in his defeat. His grown children from his marriages all emigrated to Saint-Domingue, his eldest son Auguste assigned there as a naval officer, and joined by his stepmother and sisters after the father's death. They had lost property in the French Revolution. He was among French officers who surrendered to the British during the Haitian Revolution. Auguste and his four sisters went as refugees to Charleston, South Carolina, where two sisters died of yellow fever. One married and founded a family line with her husband in New York City. Grasse's natural, adopted Indian-French son, George de Grasse, emigrated to New York City by 1799, where he married and made his adult life. The admiral's eldest son, known as Auguste de Grasse, returned to France after Napoleon came to power, and re-entered the military. He inherited his father's title as count. François-Joseph de Grasse was born and raised at Bar-sur-Loup in south-eastern France, the last child of Francois de Grasse Rouville, Marquis de Grasse. He earned his title and supported his Provençal family. In addition, while in service in India during and after the Seven Years' War, Grasse is believed to have fathered a mixed-race, French-Indian boy with an Indian woman in Calcutta. The boy, born about 1780, was known as Azar Le Guen. Grasse brought the boy back to Paris with him for his education and formally adopted him, naming him George de Grasse. After his father's death, the young man went to the United States by 1799, where he settled in New York City. He worked for a time for Aaron Burr, likely meeting him through a connection of his father's. Burr gave him two lots of land in Manhattan, and George de Grasse became a naturalized citizen in 1804. He married well and educated his three children: his son John van Salee de Grasse was the first African American to graduate from medical school and became a respected physician in Boston; he served as a surgeon in the Union Army during the American Civil War. The eldest son Isaac became a preacher, and daughter Serena married George Downing, who became a renowned restaurant entrepreneur and civil rights activist. Following Britain's victory over the French in the Seven Years War, Grasse helped rebuild the French navy in the years after the Treaty of Paris (1763). In 1775, the American War of Independence broke out when American colonists rebelled against British rule. France supplied the colonists with covert aid, but remained officially neutral until 1778. The Treaty of Alliance (1778) established the Franco-American alliance, and France entered the war on behalf of the rebels and against Great Britain. As a commander of a division, Comte de Grasse served under Louis Guillouet, comte d'Orvilliers at the First Battle of Ushant from July 23 to 27, 1778. The battle, fought off Britanny, was indecisive. US Postage Stamp, 1931 issue, honoring Rochambeau, George Washington and de Grasse, commemorating the 150th anniversary of the victory at Siege of Yorktown, 1781.
de Grasse returned his fleet to the Caribbean. He was less fortunate in 1782 and defeated at the Battle of St. Kitts by Admiral Hood. Shortly afterward, in April 1782, Admiral de Grasse was defeated and taken prisoner by Admiral Rodney at the Battle of the Saintes. He was taken to London for a time. While there, he briefly took part in the negotiations that laid the foundations for the Peace of Paris (1783), which brought the American Revolutionary War to an end. It also realigned control of some of the Caribbean islands. Grasse was released to return to France, where he was strongly criticized for his defeat in the Caribbean. He published a Mémoire justificatif and demanded a court-martial. In 1784 he was acquitted of fault in the Battle of the Saintes. Grasse was a Commander of the Order of St. Louis and a Knight of the Order of St. John of Jerusalem. He was also a member of the American Society of the Cincinnati. 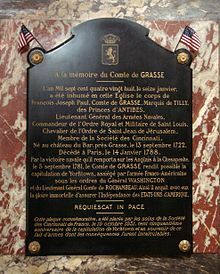 Admiral de Grasse died at Tilly ( Yvelines) in 1788; his tomb is in the church of Saint-Roch in Paris. His son Alexandre Francois Auguste de Grasse, who inherited the title of Comte de Grasse-Tilly, had a career in the French army. After his father's death, he was stationed in Saint-Domingue in 1789, where he acquired a large plantation and 200 slaves. After the Royal Navy defeated the French fleet there in 1793, during the Haitian Revolution, Auguste was among officers who surrendered and were allowed to leave. He migrated with his family (including his four sisters who had joined him) and settled for several years in Charleston, South Carolina. Two sisters died there of yellow fever in 1799. Silvie, the youngest, married and moved with her husband to New York City. After returning to France in the early 1800s, Auguste de Grasse resumed his military career. In his later years, he wrote a memoir about his father and his own travels in the New World, published in 1840 as Notice biographique sur l'amiral comte de Grasse d'après les documents inédits. A monument was installed to commemorate Admiral de Grasse and his sailors at the Cape Henry Memorial, Joint Expeditionary Base East, Virginia Beach, Virginia. It is maintained by the Colonial National Historical Park of the National Park Service. A statue of Admiral de Grasse was installed at the riverwalk landing in Yorktown, Virginia. A statue of Admiral de Grasse is in the Place de la Tour of Le Bar-sur-Loup, the French village where he was born and grew up. The Grasse River, which flows through St. Lawrence County, New York, and the hamlet of Degrasse in the Town of Russell, New York, are named for him. De Grasse was the name of two medium-sized French Line passenger ships, one built in 1924 in Scotland, and the other formally the 1956-built Bergensfjord of Norwegian America Lines, which was introduced in 1971. The first ship was famous world-wide, serving the transatlantic route; it later was used by the Allies as a troop ship in World War II. Grasse Mount in Burlington, Vermont, named for Admiral de Grasse. An anti-aircraft cruiser (in service from 1956 to 1973). A first-rank frigate of the F67 type. USS Comte de Grasse (DD-974), a large multi-role destroyer of the Spruance class. (commissioned 1978, decommissioned 1998). USS De Grasse (AP-164/AK-223), a Crater-class cargo ship used during World War II (1943–1946). USS De Grasse (ID-1217), a patrol boat used in 1918. ^ "The Operations of the French Fleet Under the Count de Grasse in 1781-2: As ... - Google Books". Books.google.com. Retrieved 2017-01-15. ^ Shea, John Gilmary (1864). Notice+biographique+sur+l'amiral+comte+de+Grasse+d'apr%C3%A8s+les+documents+in%C3%A9dits.&source=bl&ots=08EPWKVEIy&sig=iS_FWA-LnD92GpOxAanfd36r-F4&hl=en&sa=X&ved=0ahUKEwi5stjf3ZLZAhXqzVkKHa0EBcgQ6AEIRzAE#v=onepage&q&f=false The Operations of the French Fleet Under the Count de Grasse in 1781-2: As Described in Two Contemporaneous Journals. Bradford Club. ^ a b Stewart (2008), p.95. ^ "François-Joseph-Paul Grasse". newadvent.org. Retrieved 19 May 2015. ^ Burridge, Pauline E. (December 3, 1930). "Glimpses of Grasse Mount, Part II". Vermont Alumni Weekly, Vol. X, No. 10. ^ "Herbert Hoover: Message to Dedication Ceremonies for a Monument of Admiral Comte de Grasse at the Trocadero Palace in Paris, France". Presidency.ucsb.edu. 1931-05-04. Retrieved 2017-01-15. ^ William H. Miller Jr., Picture History of the French Line, Dover Publishing, 1997. Lacour-Gayet, Georges, La Marine militaire de la France sous le règne de Louis XV (Paris, 1902). Lewis, Charles Lee. Admiral de Grasse and American independence. Arno Press, 1980. This article incorporates text from a publication now in the public domain: Chisholm, Hugh, ed. (1911). "Grasse, François Joseph Paul, Comte de" . Encyclopædia Britannica. 12 (11th ed.). Cambridge University Press. p. 369. Wikimedia Commons has media related to François Joseph Paul de Grasse.
" All men are created equal"
" Life, Liberty and the pursuit of Happiness"
" Consent of the governed"